GoPro today announced its new product lineup including its £379.99 flagship, HERO7 Black, which sets a new bar for video stabilisation with its standout feature, HyperSmooth. HyperSmooth makes it easy to capture professional-looking, gimbal-like stabilised video without the expense or hassle of a motorised gimbal. HyperSmooth works underwater and in high-shock and wind situations where gimbals fail. HERO7 Black with HyperSmooth video stabilisation. With HERO7 Black, GoPro is also introducing a new feature called TimeWarp; TimeWarp Video applies a high-speed, ‘magic-carpet-ride’ effect to your videos. Imagine a scenic drive, ocean dive or walk through the city compressed into a super-stabilised, sped-up version of itself, with the entire experience playing out in seconds. TimeWarp Video transforms longer experiences into short, flowing videos that are compelling to watch and easy to share. o Short Clips – Restricts video recording to 15- or 30-second clips for faster transfer to phone, editing and sharing. Great for new users and children. GoPro has a new HERO camera for everyone this autumn, including newbies, active go-getters and social sharers of all ages. Joining HERO7 Black to round out the lineup are HERO7 Silver and HERO7 White – great active-lifestyle cameras for entry and mid-level users. The 4K £279.99 HERO7 Silver and 1080p £179.99 HERO7 White are tough, tiny and waterproof to 33 feet (10m). Tell them what to do using voice commands, or just tap the shutter button, and the camera will turn on and capture the moment automatically. And of course, it wouldn’t be a GoPro without the stunning video and photo quality that’s made GoPro the best-selling camera in North America for more than four-and-a-half years straight. Both HERO7 Silver and White feature significantly improved video stabilisation, making it easier to get great looking shots on-the-go. 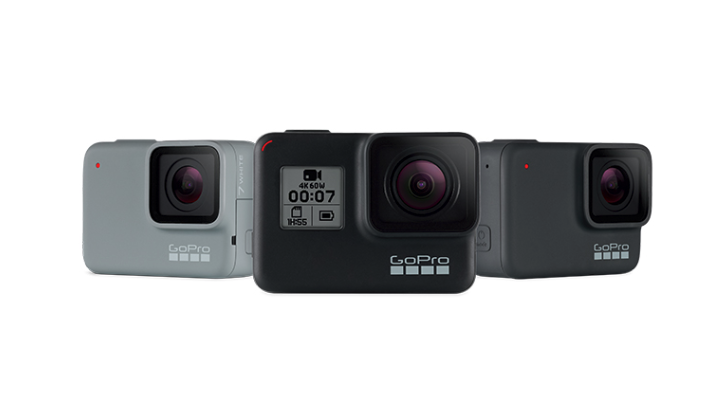 The £379.99 HERO7 Black, £279.99 HERO7 Silver and £179.99 HERO7 White are available for pre-order today at GoPro.com. Cameras will be available in-store internationally beginning Thursday, September 27.